A survey by the News Co/Lab at Arizona State University and Google Surveys. The News Co/Lab at Arizona State University’s Walter Cronkite School of Journalism and Mass Communication, with help from Google Surveys, polled more than 6,000 U.S.-based web users from May 7 to May 10, 2018, to learn about their attitudes toward news. Google’s weighting system was applied to obtain a sample that represents American adults. The survey asked what words came immediately to mind when people were presented with the words “news” or “local news.” In addition, it asked people whether they find it is easy or difficult to distinguish news from opinion. 1. When people talk about ‘fake news,’ they are almost never thinking of local news. The word “fake” is associated with the word “news” 19 percent of the time, but it is associated with “local news” at a far lower rate, only 3 percent of the time. But when asked the same question about local news, people responded in neutral, hometown terms, with the top answer — 23 percent of the time — containing the name of their city or region, local paper or local television or radio station. 2. Most people react to ‘news’ or ‘local news’ with neutral words. Despite the many headlines about “fake news,” the news consumers surveyed usually associated the words “news” or “local news” with neutral terms. Popular neutral words include “information,” “paper” and “television,” as well as repeating the words “news” and “local” themselves. When thinking of “local news,” more than two-thirds of the respondents used neutral words. Those reactions often included place-based references, such as names of towns or local media, as well as coverage areas such as weather and crime. Only 21 percent used negative words. 3. Most people say they can easily distinguish news from opinion — but 16 percent say they find it difficult. 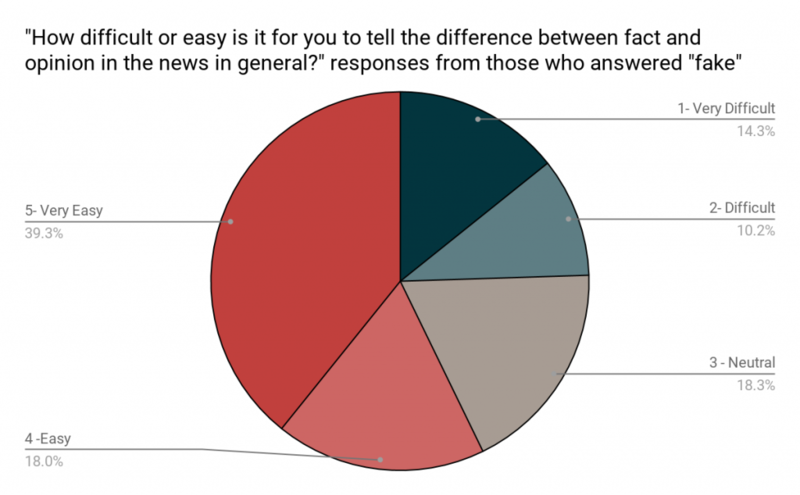 Sixty-one percent of those who responded to the News Co/Lab surveys think it’s easy or very easy to tell fact from opinion in the general flow of news. Cable TV news viewers are slightly less clear on the difference (57 percent say they can tell news from opinion). Local news consumers are more clear (63 percent say they can tell news from opinion). Still, a significant number overall — 16 percent of the respondents — said they find it difficult or very difficult to tell the difference between fact and opinion in the news. The line between news and opinion is more difficult for cable TV news viewers (18 percent). Local news again is more clear, with only 13 percent of people indicating difficulty distinguishing fact from opinion in that format. 4. The people who associate the words ‘news’ or ‘local news’ with the word ‘fake’ have more difficulty telling news from opinion. As a group, people who associate news or local news with the word “fake” reported more difficulty telling news from opinion than those who gave other answers. Some one in four have difficulty with the line between news and opinion in general, and one in five have trouble telling news from opinion in local news. 5. ‘Fake’ feelings about news in general can rub off on local news. Overall, “local news” is viewed more favorably than just plain “news.” But the negatives for local news increase when people are asked first about news in general, and then about local news. When people first thought about news, and then were asked about local news, the percent of negative responses grew 8 percentage points — from 17 percent to 25 percent. Seventy-three percent of the negative local news responses followed a negative response to news in general. Only 6 percent followed positive news associations. Finding #1: When people talk about ‘fake news,’ they are almost never thinking of local news. The two word clouds below illustrate responses to word association questions about news and local news. Responses are color-coded by sentiment: negative responses are blue, positive responses are red and neutral responses are gray. Fig. 1. 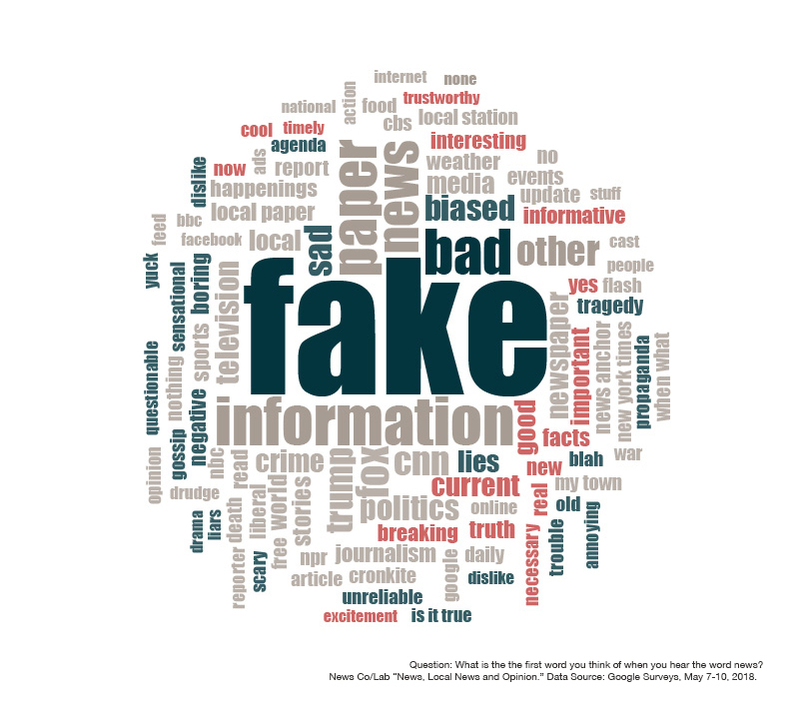 A word cloud of the responses to the question “What is the first word you think of when you hear the word news?” The word “fake” was provided by nearly 1 in 5 respondents. Click on image to view larger. Study: “News, Local News and Opinion.” Source: Google Surveys, May 7-10, 2018. Fig. 2. 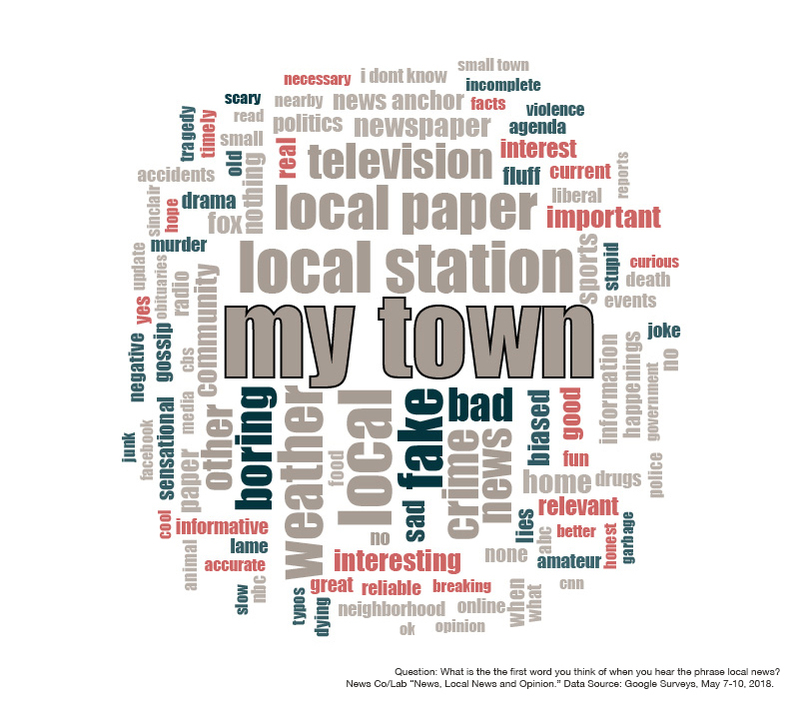 A word cloud of responses to the question “What is the first word you think of when you hear the phrase local news?” More than 1 in 5 respondents provided hometown answers naming their cities or local news outlets. Click on image to view larger. Study: “News, Local News and Opinion.” Source: Google Surveys, May 7-10, 2018. Finding #2: Most people react to ‘news’ or ‘local news’ with neutral words. Despite the many headlines about “fake news,” the web users surveyed usually associated the words “news” or “local news” with neutral terms. Popular words include “information,” “paper” and “television,” as well as repeating the words “news” and “local” themselves. Fig. 3. 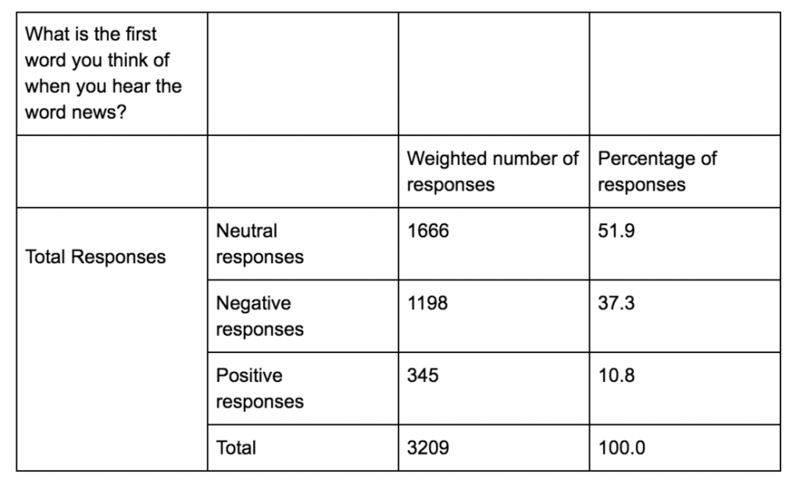 Most people (51.9%) provided neutral responses to the question “What is the first word you think of when you hear the word news?” Negative responses came from 37.3% of the respondents; positive responses from 10.8%. Study: “News, Local News and Opinion.” Source: Google Surveys, May 7-10, 2018. 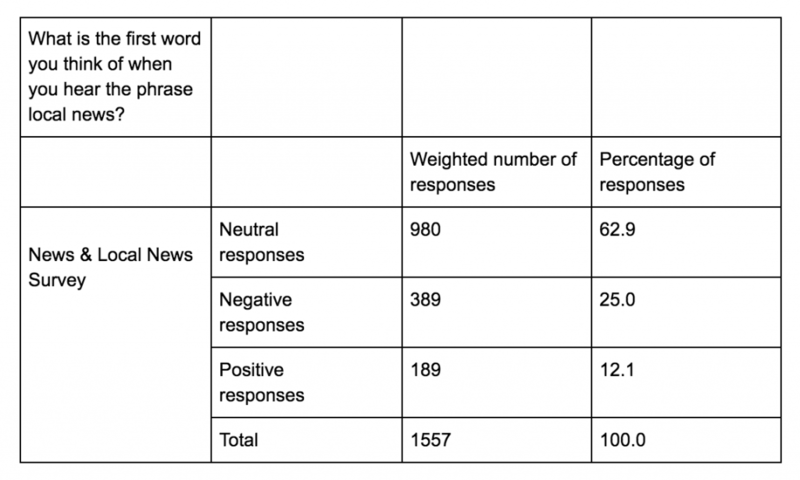 When thinking of “local news,” more than two-thirds of the respondents used neutral words. Those reactions often included place-based references, such as names of towns or local media, as well as news coverage areas like weather and crime. Only 21 percent used negative words. Fig. 4. 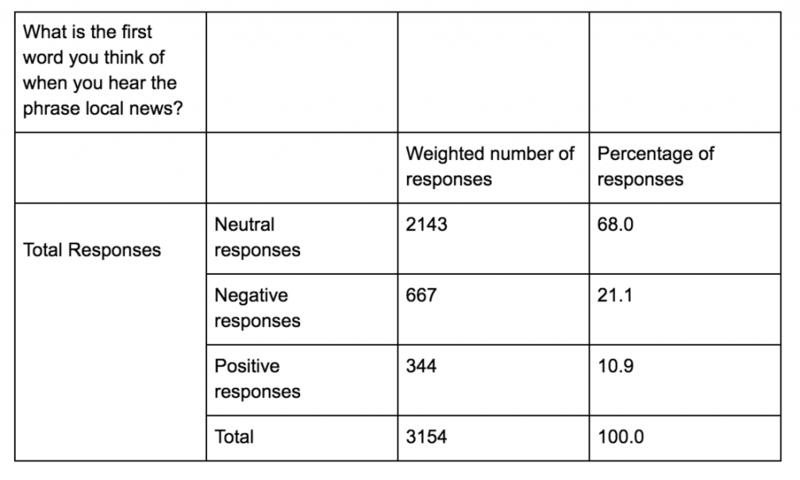 More than two-thirds (68%) of the respondents used neutral words to describe their reaction to the phrase “local news.” Negative responses came from 21.1% of the respondents; positive responses from 10.9%. Study: “News, Local News and Opinion.” Source: Google Surveys, May 7-10, 2018. Recent research from the Media Insight Project also found people have a more positive view of their local newspaper and television stations than they do of national counterparts. In addition, a 2017 Morning Consult + Politico poll and a Knight Foundation-sponsored study indicate that people have a higher degree of trust in their local news outlets. 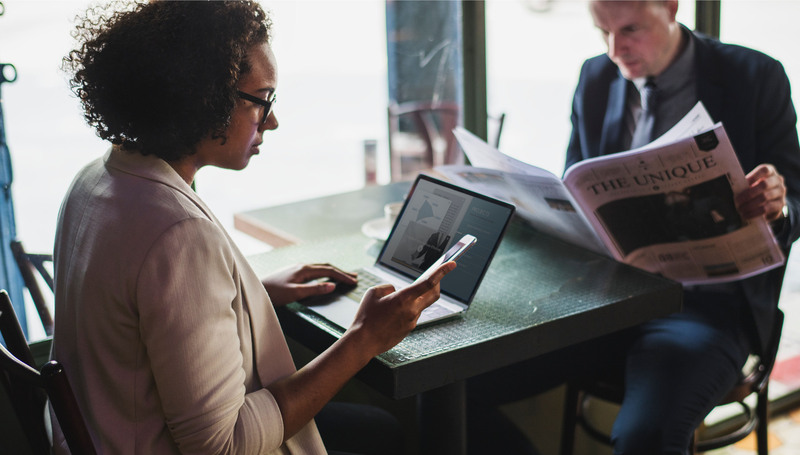 The differences between reactions to news and local news suggest people directly connect local news to their lives but news in general doesn’t necessarily hold the same personal relevance. Finding #3: Most people say they can easily distinguish news from opinion — but 16 percent say they find it difficult. 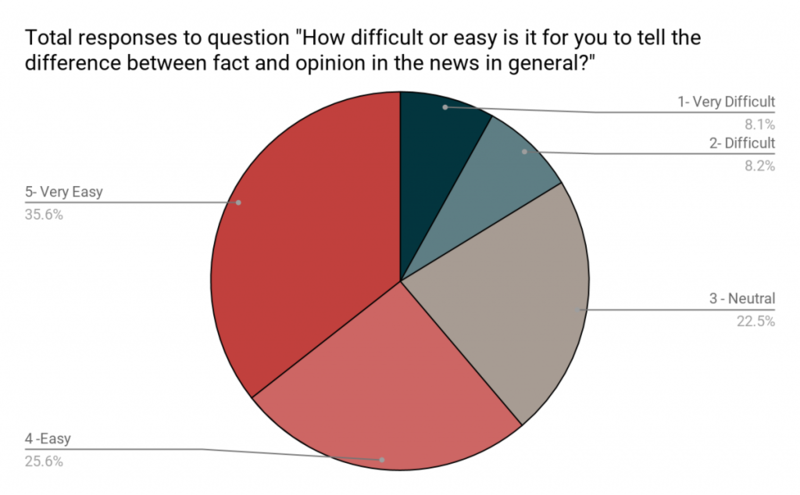 Sixty-one percent of those who responded to the News Co/Lab survey think it’s easy or very easy to tell fact from opinion in the general flow of news. Cable TV news viewers are slightly less clear on the difference (57 percent say they can tell news from opinion). Local news consumers are more clear (63 percent say they can tell news from opinion). Still, a significant number overall — 16 percent of the respondents — said they find it difficult or very difficult to tell the difference between fact and opinion in the news. The line between news and opinion is more difficult for cable TV news viewers (18%). Local news again is more clear, with only 13 percent of people indicating difficulty distinguishing fact from opinion in that format. These results reinforce a Media Insight Project survey, in which a majority (55%) said they found it easy to tell the difference between news and commentary. The high degree of confidence reported across media types also coincides with recent research from Pew Research Center, which found that Americans are more likely than not to correctly identify fact and opinion statements. However, the number of people who actually misidentified three or more out of five factual statements in Pew’s study is 10 percent higher than those who self-reported difficulty (28% vs 18%). Taken together, results indicate a possible discrepancy between people’s perception of their ability and their actual ability to tell the difference between fact and opinion. Fig. 5. Most respondents find it easy to distinguish between fact and opinion. 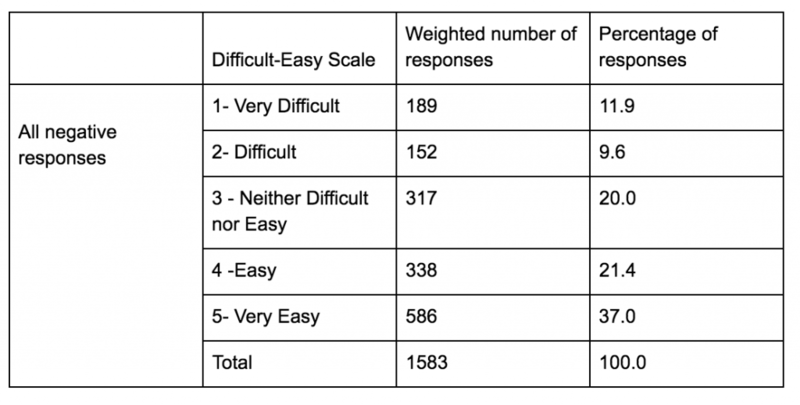 More than 60 percent find it very easy or easy (35.6% and 25.6%, respectively). Twenty-three percent answered neutral (neither difficult nor easy), 8.2% answered difficult and 8.1% answered very difficult. Study: “News, Local News and Opinion.” Source: Google Surveys, May 7-10, 2018. Finding #4: The people who associate the words ‘news’ or ‘local news’ with the word ‘fake’ have more difficulty telling news from opinion. Specifically, 24 percent of those who labeled news as “fake” had difficulty telling news from opinion in news in general. Among those who did not label news as fake, only 15 percent reported difficulty. In addition, 20 percent of those who associated the phrase local news with the word fake had difficulty telling news from opinion, compared with 17 percent who did not label local news as fake. Fig. 6. People who responded to news or local news with the word “fake” reported more difficulty telling fact from opinion. 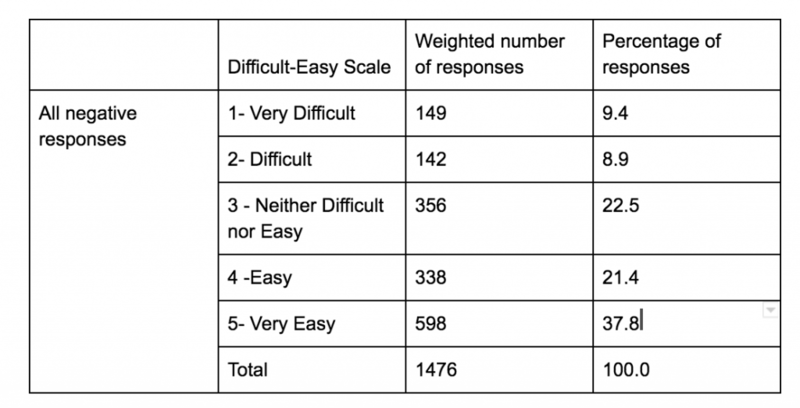 Twenty-five percent find it very difficult or difficult (14.3% and 10.2%, respectively). Eighteen percent answered neutral (neither difficult nor easy), 18% answered easy and 39.3% answered very easy. Study: “News, Local News and Opinion.” Source: Google Surveys, May 7-10, 2018. In contrast, people who gave positive responses to the words news and local news reported less difficulty in telling fact from opinion. Only 13 percent of them said they had that problem in general, and just 10 percent for local news. The number did rise to 16 percent when they were asked about sorting news from opinion on cable TV news. Finding #5: ‘Fake’ feelings about news in general can rub off on local news. 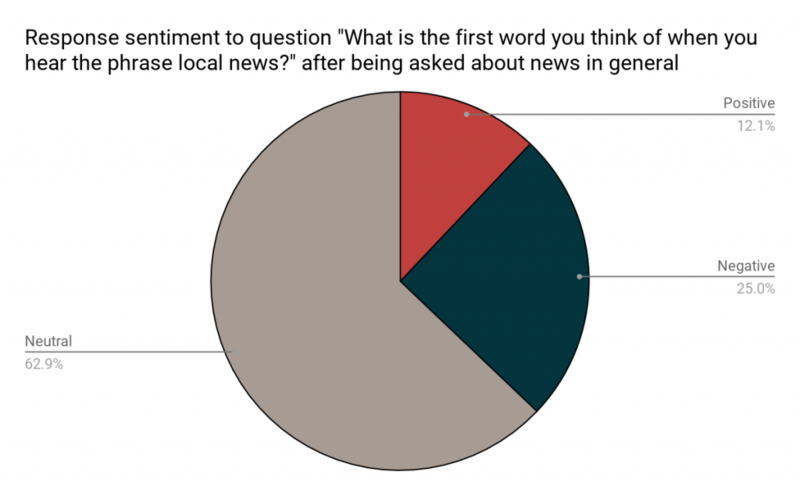 Overall, “local news” is viewed more favorably than just plain “news.” But the negatives for local news increase when people are first asked about news in general, and then asked about local news. When people first thought about news, and then were asked about local news, the percent of negative responses grew 8 percentage points — from 17 percent to 25 percent. Of those negative local news responses, 73 percent followed a negative response to news in general. Only 6 percent followed positive news associations. Significantly, 91 percent of the “fake” responses to local news came after a “fake” response to news in general. An interesting sidelight: when people were asked first about news, and then about local news, they were less likely to be neutral about local news. This means, in addition to an increase in negative responses about local news, there was also a slight increase in positive responses — from 10 percent to 12 percent. 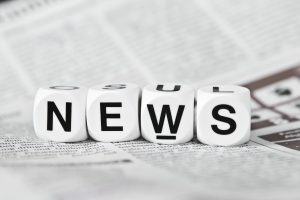 The increase in both negative and positive responses further indicates a connection between news and local news sentiments. Fig. 7. When people are asked only to react to the phrase local news, 72.9% replied with neutral terms, 17.4% negative and 9.7% percent with positive terms. Study: “News, Local News and Opinion.” Source: Google Surveys, May 7-10, 2018. Fig. 8. When people are asked react to the phrase local news after being asked about news in general, 62.9% replied with neutral terms, 25.0% negative and 12.1% percent with positive terms.Study: “News, Local News and Opinion.” Source: Google Surveys, May 7-10, 2018. Information provided in this report comes from three brief online surveys conducted concurrently by the News Co/Lab from May 7-10, 2018. Each survey garnered approximately 2,000 complete responses from a representative sample of U.S.-based users on websites in the Google Surveys Publisher Network. 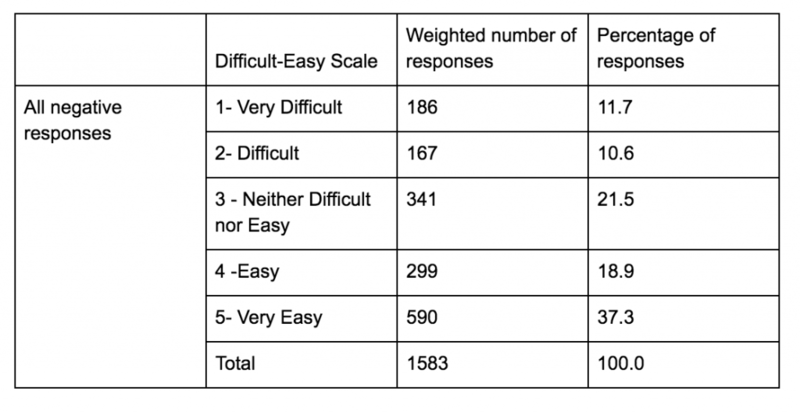 Weighted results from completed surveys were used as the basis for the analysis. Inferred demographic information, including age, gender and geography, was weighted to create a representative sample. 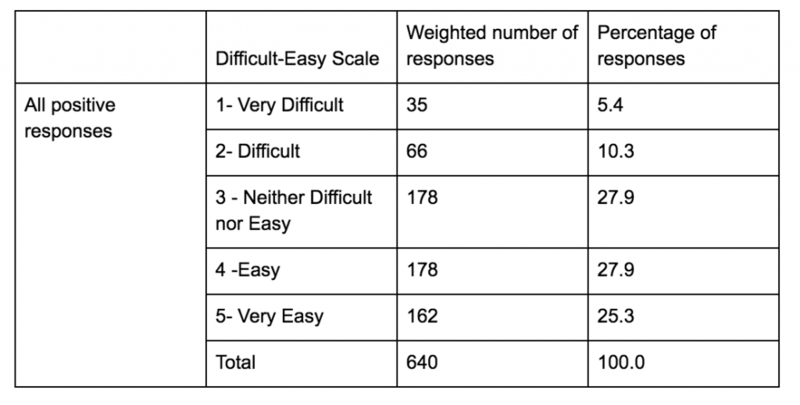 The number of total respondents represents the total unweighted data collected; the number of responses analyzed decreased once weighting methodology was applied. More about Google Surveys’ methodology, including sampling bias and modeled margin of error, can be found here. Data were analyzed relative to different demographic factors, however News Co/Lab researchers did not find such notable differences among groups to include in this report. Complete datasets are available for public download, and we encourage further investigation. View complete results at News Co/Lab News Word Association Survey, Local News Word Association Survey and News & Local News Word Association Survey. Download a PDF of the full report. Surveys were conducted with support from Google, which donated the survey administration costs. 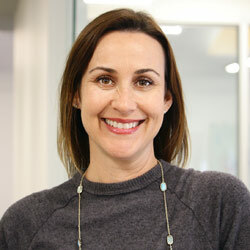 We are thankful to Amy Adams Harding, global head of Google Surveys Publisher Development, for her suggestions for developing the word association questions. 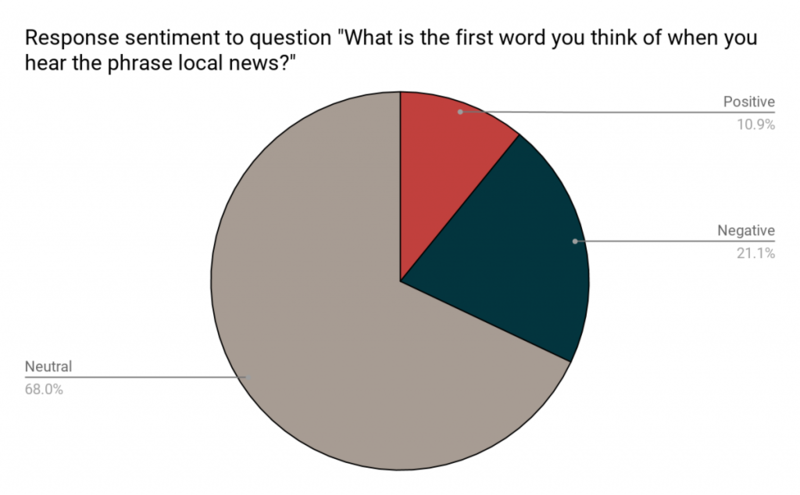 The third survey asked respondents both the news and local news word association questions. How difficult or easy is it for you to tell the difference between fact and opinion in the news in general? How difficult or easy is it for you to tell the difference between fact and opinion in cable TV news? How difficult or easy is it for you to tell the difference between fact and opinion in local news? 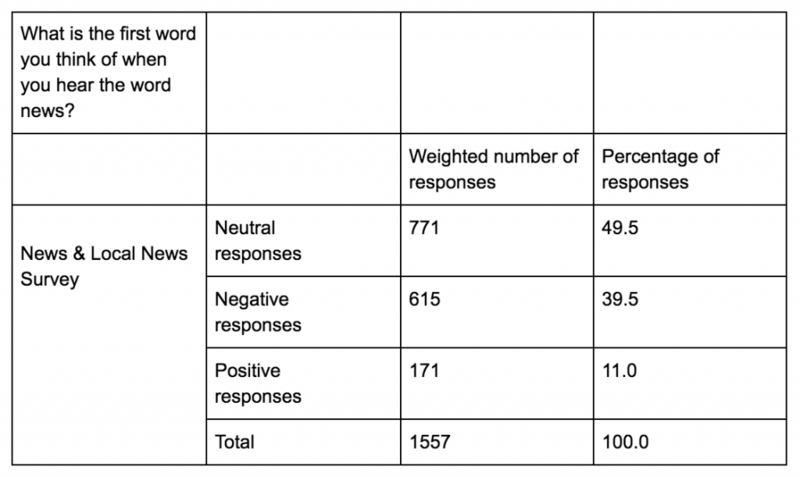 The final list of categories was further classified by positive, negative and neutral words in order to assess sentiment toward the words news and local news, and the differences between them. 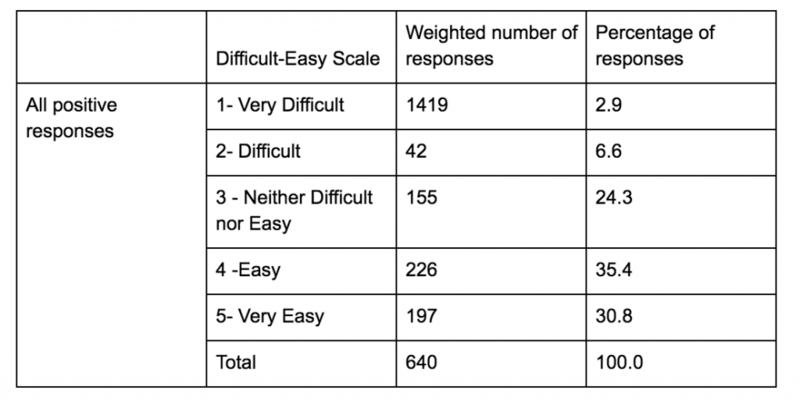 Results from the three surveys were analyzed both separately and combined. Word clouds, sentiment and topline fact and opinion results outlined in the report come from the combined total relevant responses from all surveys (figures 1-6). 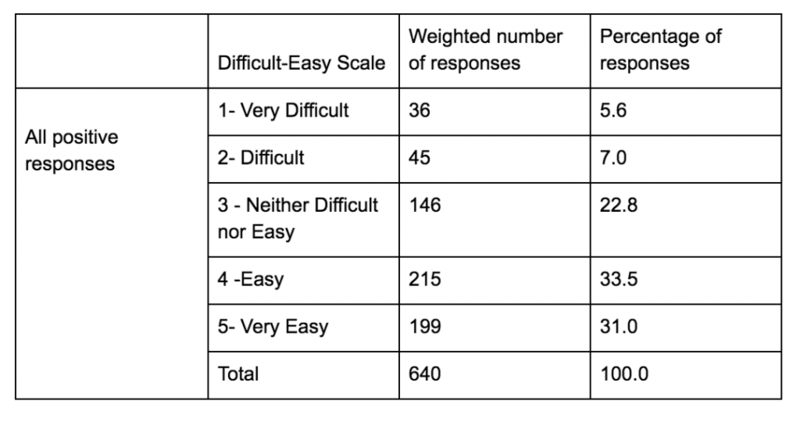 Responses from the local news survey and joint news-local news survey were analyzed separately to compare “fake” responses (figures 7-8). The following tables show complete data from all results included in the report. Some tables support key points illustrated in charts included earlier in the report and others provide additional supporting information. Note: Weighted results from completed surveys were used as the basis for the analysis, but data were analyzed with and without weighting. Weighting accounted for small percentage changes to some responses, but did not change any findings outlined in the report. However, weighting did result in lower gross responses. 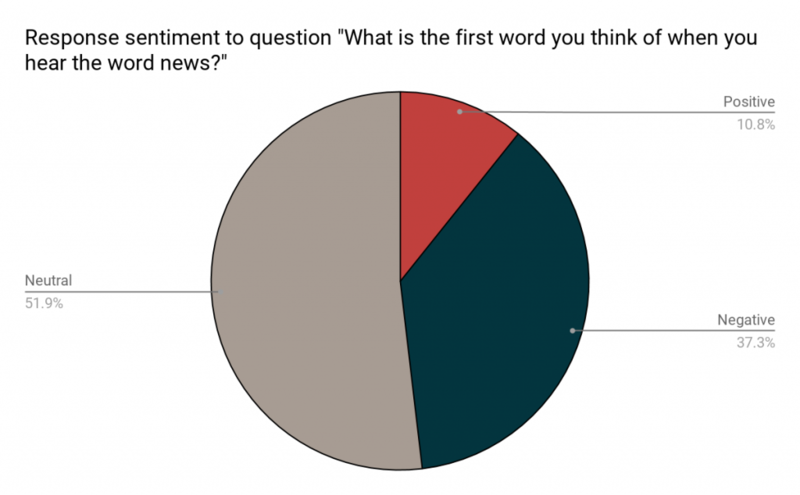 All responses to the question “What is the first word you think of when you hear the word news?” were combined to calculate the overall sentiment. 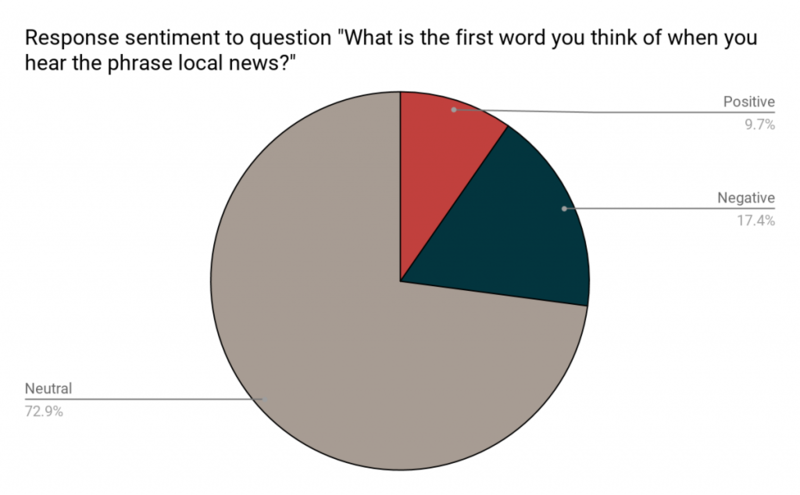 All responses to the question “What is the first word you think of when you hear the phrase local news?” were combined to calculate the overall sentiment. The next two tables detail responses from survey participants who were asked the word association question about news and local news. All responses to the question “How difficult or easy is it for you to tell the difference between fact and opinion in the news in general?” were combined to calculate the overall percentages.